Our journey to the Democratic Republic of the Congo (DRC) has had us first landing in Zambia, or the "real" Africa. After a long, squashed bus ride we arrived at Kachele Farm, the Hands at Work gathering place here in Zambia. We were coming here to meet up with many Hands leaders from all over the continent: Malawi, Nigeria, Zambia, Zimbabwe and the DRC. We were given this opportunity to join these people in a workshop before we head up north to the DRC. We have felt so blessed and encouraged by merely being in the presence of these leaders. Their humbleness and servant hearts are so evident. In coming to Africa as an international volunteer from Canada, we can sometimes feel as though we have sacrificed a lot: our jobs, money, time, comfort... But as soon as I sit down with the people we work with, I realize that I haven’t really sacrificed anything. We are giving a year, but these people have given their lives. Sacrificing opportunities to have worldly success, they have humbled themselves to serve our King through caring for 'the least of these'. Many of them have taken in orphans themselves or give the little they have to help families in the communities they serve. They are carrying the yoke of the oppressed and the burden of those who are in need. When I came across this verse I thought it portrayed what we are experiencing here in Zambia: "Join with others in following my example, brothers, and take note of those who live according to the pattern we gave you." (Philippians 3:17) I pray that God is changing us through those around us to be more the people He has created us to be: loving, compassionate, sacrificial, humble and a vessel of hope. 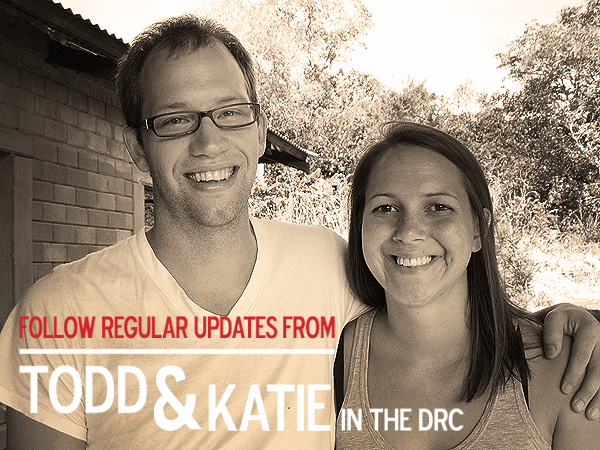 Check back for regular updates from Todd and Katie.